Arcademics - Arcade + Academics = Fun Learning! This site combines arcade games with academics to give it a fun and academic way for your children to spend their time. There are tons of free games you can play on many different subjects from geography to subtraction or division to counting. They have games ranging from 1st-6th grade and you'll have fun while you're playing them. BigFish Games - A new game every day! Games at All My Faves - A whole host of games linked to from this website! DisneyGames - Lots of online games for children to play.They are always adding new games for the latest movies and books that are out. For example they have a Jungle Book game and a Frozen game after the movies that are newly in theaters. These games are free and at all age levels. You will want to monitor your children are playing games appropriate for their level, but there are many games to choose from. Edheads - This is a great simulation game that helps you explore STEM more fully. You can practice surgery, or learn about biology, or follow a technician around to learn more about machinery. Funbrain - Funbrain offers many free online games for children and parents alike. They have games that incorporate learning such as the games you'll find in the Math Arcade, or the Reading section offers many books and comics children can read for free or purchase on the site. You can also pick which grade level you're child is in to help them better find games at their level. They have games for K-8th grade. Parents can trust Funbrain to deliver a fun and safe experience for even the youngest children. The Playground helps parents introduce their preschoolers to the Internet and teaches them how to manipulate the mouse and keyboard. GameSpot - Nobody knows games and gamers like GameSpot. Our love of games combined with our experience, innovation, and commitment makes GameSpot the standard for all things gaming. For 16 years, we've been 100-percent focused on games. We understand that today's gamers play for many different reasons, and we're able to engage this growing number of diverse gamers no matter why they hit play. Keyboarding Games - Below is a list of games for practicing keyboarding. Learning Games for Kids - ​Educational games are a great tool for building foundation math and language skills that today's elementary school curriculum requires. These online learning games and songs for kids are fun, teach important skills for preschool and elementary school kids and they're free. Want educational games that help build skills in math, language, science, social studies, and more? You've come to the right place! 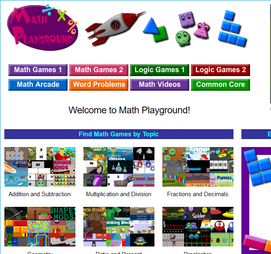 Math Playground - Offers so many fun math games that you will love to play. These games are interactive and fun you won't even know you're learning math! There are games for children of all ages, Math Playground offers games for students in grades 1-6 and many other games anybody can try. Math Playground also offers IPad apps you can download and play anywhere. These apps are easy to use and fun! They have apps that help you create, that help you with addition, subtraction, multiplication or division, and they have apps where you can make your own puzzles. With the wide variety of apps you can take on the go, you can play Math Playground anywhere! NASA's Climate Kids - This is a site done by NASA to help children play games to learn the dangers of pollution on the climate, global warming hazards, and animals. You can play Leaps and Flutters and learn all about endangered frogs and butterflies and how you can help! Nick Jr. - This site has games that incorporate all the characters children love from Nick Jr. on TV. You can play many preschool games that incorporate characters such as Paw Patrol, Bubble Guppies, or Dora the Explorer. These games are interactive and also create a fun learning environment. Are you also looking for a fun way to draw for free? Well Nick Jr.'s Free Draw offers a chance to play with crayons, markers, paint, and pencil to draw and create fun pictures for the whole family. ​Playing History - This website gives children a chance to play games that introduce them to history in a fun way! You can play games based on American history, or European history. These interactive simulations teach kids about history in a fun and new way. You can learn about what a Republican or Democratic senator does for it's state. You can argue about civil rights movement concerns. You get to be involved with history in a way that you can't with a textbook. Pogo - Play over 100 free online games! Pokemon GO - This is the new wave that is sweeping the nation! The Pokemon you know and love on your phone and gets you up and moving. You must travel the real world to find your Pokemon, battle in gyms, or meet up with other players to join a team. Travel between the real world and the virtual world of Pokémon with Pokémon GO for iPhone and Android devices. With Pokémon GO, you’ll discover Pokémon in a whole new world—your own! Pokémon GO is built on Niantic’s Real World Gaming Platform and will use real locations to encourage players to search far and wide in the real world to discover Pokémon. Pokémon GO allows you to find and catch more than a hundred species of Pokémon as you explore your surroundings. Puzzle Prime - This fun website is full of a variety of puzzles and brain teasers that will challenge you for hours. If you get tired of puzzles, this site also offers a large number of fun games and optical illusions to keep you entertained. According to the site, ​"Whether you are on a break, waiting for a flight, or just relaxing at home, Puzzle Prime will offer you all the best puzzles you could ever want. With many sections to choose from, including Brain Teasers, Detective Mysteries, Logic Games, and more, there is always something fun to do at Puzzle Prime!" ​Puzzles.com - A puzzle playground with a treasury of classic and modern puzzles. They have many genres of puzzles from logic, to numbers, to shape puzzles. There is a puzzle for everyone on this site. 2PG Games - Welcome to the new 2pg.com. We are the best destination for 2 player games online and multiplayer games as well as games that allow more than one player (mostly two players) to play on the same device. While our focus is mainly 2 player games you can find many games including online multiplayer and 2 or more player games for mobile devices including tablets, Ipads, Iphones, android phones, and literally any kind of smartphone online. We strive to add the best games so we will be reviewing each and every game we add before we add it and we will also try to have some video reviews for our online games for you on a pregame page including screenshots so you can see what the game is about before you load and play it. In the home page you will find a selection of our featured two player and multiplayer games while in the middle of the page you will see our new games. You will also find a nice selection of the top 1 player games as well as we love playing any kind of games making 2pg.com your destination even if you are playing alone. Most of our games have an Al opponent either way so you can play alone too. You can easily add our games on your website as well as share them with your friends. By signing up to our site not only you support us but you also see less ads and a much cleaner and faster site so as you can focus on playing. Favorite your best online games and save them for later. Have fun and play with friends on the same device or over the world. Enjoy 2pg. Secret Builders - SecretBuilders is an online virtual world where students come to play games, interact with famous characters of cultural and historical significance, and go on Quests that span the world! Starfall - This is a Pre-K, kindergarten, or first grade site and app. This helps kids learn to read and learn their ABC's. These games on the site come at a price to join, but their app is free and is available on Apple, Google Play and Amazon Apps formats. Tate Kids - This is a great way to explore your creative side! With lots of fun art games you can explore and create art. They have many games that involve art, such as coloring, street art, and the game Art Detective allows you to explore the mysterious objects found at Tate Britain. There is also the Art Lab game that allows you to create and practice your art skills. These games are perfect for those who want to create and explore the world of art. Zynga - Play free online games with friends. All those Facebook games you know and love like FarmVille, Words with Friends, Hanging with Friends, etc. are all on this free and easy to use game website.